Eco-conscious parents take extra care selecting what goes into their child’s backpack — from waste-free lunches to recycled paper notebooks… but is your child’s backpack as safe and eco-friendly as its contents? Thanks to Ecogear, tikes can tote all their school paraphernalia in sustainable style by slipping on an Ecozoo backpack. 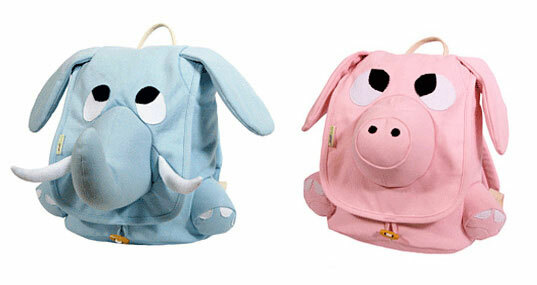 Kids may choose from an adorable array of characters including an elephant, pig, panda and puppy. The ideal classmate, each ‘pet’ in the Ecozoo series is made of organically grown cotton canvas and rope materials, non-toxic dyes, recycled plastic components, sustainable wood accents, and features padded shoulder straps and internal pockets. Ecozoo backpacks will put your kids at the head of the class in cuteness and comfort, while teaching everyone a lesson or two about going green. Love these. My boys have fall birthdays and one of these would be perfect! Cheryl- Be sure to enter our giveaway so you can win one for your boys! Where are these backpacks made? Great article! Very interesting and informative. This is very useful for moms planning to have their back to school shopping for their kids. I'll be back soon to check your new post. Eco-conscious parents take extra care selecting what goes into their child's backpack -- from waste-free lunches to recycled paper notebooks... but is your child's backpack as safe and eco-friendly as its contents? Thanks to Ecogear, tikes can tote all their school paraphernalia in sustainable style by slipping on an Ecozoo backpack. Kids may choose from an adorable array of characters including an elephant, pig, panda and puppy. The ideal classmate, each 'pet' in the Ecozoo series is made of organically grown cotton canvas and rope materials, non-toxic dyes, recycled plastic components, sustainable wood accents, and features padded shoulder straps and internal pockets. Ecozoo backpacks will put your kids at the head of the class in cuteness and comfort, while teaching everyone a lesson or two about going green.